It is widely known that the first gen B16A is designed for two O2 sensors located up near the head of the engine. Some people elect to run headers which may not have two holes in this location (ie DC Sports 4-1 Header) The options are to drill two new holes in the header and weld on new bungs which really messes up the ceramic coating. Or run a single O2 down by the collector but this location is not nearly as hot as the bungs right outside the head, so a 1 wire sensor may suffer from being too cold plus it may have trouble getting a good ground through the ceramic coating. The ideal solution would be to run a heated 4 wire O2 sensor. This was my solution. This is a quick schematic of the setup. 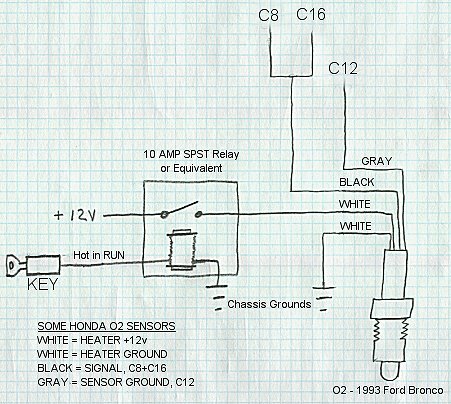 Basically, I used a 1993 Ford Bronco O2 sensor (Bosch - $40). You can pigtail both O2 wires from the ECU (C8 and C16) because the new O2 is sampling the combined gas from all four cylinders. C12 is the sensor ground and provides an accurate reading regardless of any header coating. All that is left is to wire a simple relay to click on when the ignition is in "RUN" If someone were to get really fancy, the next step would be a current monitor for the heater circuit...of the heater goes, you would get a warning. But I figure that the bad sensor will show up with an ECU code anyway. Some tips...the heater wires are the two wires of the same color (they may be either both black or both white) it does not matter which goes to +12V and which goes to ground. Also, ideally, C8 + C16 splice would be made as close to the computer as practical to eliminate a big inductance loop. This wire is also shielded from the factory...probably not a bad idea to use shielded wire, but doesn't seem to be necessary. Last tidbit of info...crimp the wires to the sensor. It needs a reference to the atmospheric oxygen to function properly. If you solder, the oxygen may not be able to diffuse along the wires (that's where it enters the sensor).